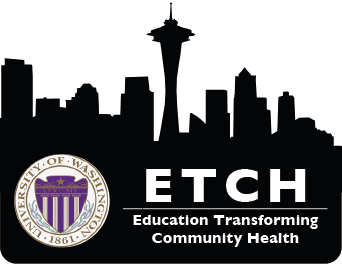 ETCH (Education Transforming Community Health) is recruiting new officers! ETCH is an interdisciplinary student project associated with SHIFA, a non-profit organization based out of UWSOM. We offer weekly health education sessions to homeless adults in downtown Seattle, striving to create health education curriculum that bridges evidence-based practice and the voices of the many homeless communities in Seattle. We aim to provide knowledge, skills, and tools to improve the quality of life of our participants. Weekly sessions offer volunteers a great opportunity to connect with members of homeless communities while expanding your knowledge of preventative care, health systems, and social justice. We ask that volunteers participate in at least one session per month for at least 6 months – with many more opportunities for volunteering, advocacy, and leadership. This entry was posted in Student Groups. Bookmark the permalink.